As more employers look to hire registered nurses (RNs) that have a Bachelor of Science in Nursing (BSN), Linfield College’s online RN-to-BSN program has gotten kudos for its affordability. BestValueSchools.com has ranked Linfield’s program #15 nationally in its list of top 30 online RN to BSN programs. The ranking places Linfield #1 on the west coast for financial accessibility. 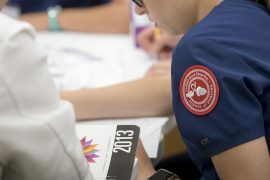 “A top online RN-to-BSN degree for the globally-minded, Linfield even hosts an annual International Service Learning program just for BSN students,” BestValueSchools.com continues. The website’s ranking factors include include affordability (average annual tuition and fees), size/popularity (average number of students that the program graduates each year), and growth (five-year change in the size of the program’s graduating class). This entry was posted in Latest News and tagged Linfield-Good Samaritan School of Nursing, Online and Continuing Education, RN-to-BSN. Bookmark the permalink.